Samsung has launched a new digital Payment service app "Samsung Pay" in India, making it possible to store debit/credit card, digital wallets as well as UPI under one shed. Samsung Pay offers a simple and secure way to make payment at various retail locations. The User needs to register their card details or wallet details once in this mobile app and further payment can be done using this app only. With the help of this app Samsung trying to eliminate the need to carry cash or cards in your wallet. Samsung Pay offers three level of security -fingerprint authentication, card tokenization and Samsung’s defense-grade mobile security platform Samsung KNOX. These three security mechanism makes this app a highly secure platform for making payments. Samsung Pay is very easy to use, update or download the latest version of Samsung Pay App on eligible Samsung Galaxy Smartphone or Gear, open the Samsung Pay app and link their bank or Paytm or credit/debit card accounts. 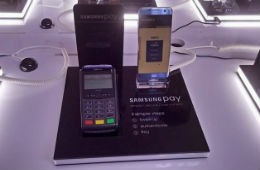 To launch Samsung Pay, from Samsung smartphone, select the card, authenticate using a fingerprint or PIN and bring the phone near the Point of Sale terminal. Samsung Pay also allows the user to integrate PayTm accounts into Samsung Pay, after enabling PayTm user can pay via QR Code scanning, generating one-time codes for merchant payments and also do peer to peer money transfers as supported by PayTm. The Samsung Pay UPI solution is powered by Axis Bank and facilitates peer-to-peer (P2P) transfer of funds between bank accounts on a mobile platform instantly. This is an upcoming feature within Samsung Pay.